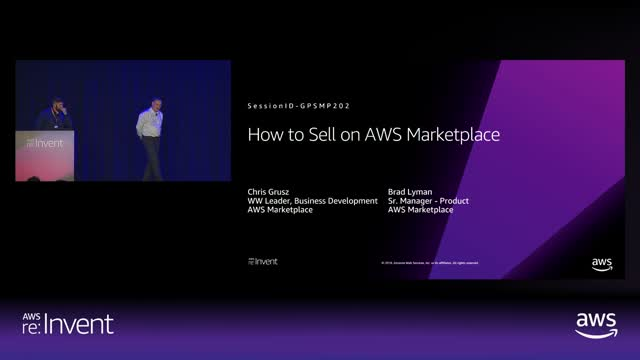 In this session, we describes the steps for listing your product on AWS Marketplace. Learn how leading ISVs are reaching new customers and decreasing the time it takes to close transactions using AWS Marketplace. This session is intended for: Non-technical Audiences. True accountability for the security of cloud-based assets requires visibility into the events and behaviors that move into and through your cloud environment. Security today relies on visibility in several areas: networks, systems, storage and applications. In this recorded webcast, SANS Analyst and cloud security expert Dave Shackleford explains how visibility in the cloud differs from more traditional security visibility and suggests how organizations can move toward establishing a cloud visibility strategy, using practical examples to illustrate the process. Register for this webcast to be among the first to receive the associated whitepaper written by Dave Shackleford. Dave Shackleford, a SANS analyst, instructor, course author, GIAC technical director and member of the board of directors for the SANS Technology Institute, is the founder and principal consultant with Voodoo Security. He has consulted with hundreds of organizations in the areas of security, regulatory compliance, and network architecture and engineering. A VMware vExpert, Dave has extensive experience designing and configuring secure virtualized infrastructures. He previously worked as chief security officer for Configuresoft and CTO for the Center for Internet Security. David Aiken is a Solutions Architect Manager at AWS Marketplace and is an AWS Certified Solutions Architect. He leads a team of specialist SA's that help customers implement security and governance best practices. His skills include cloud computing, enterprise architecture, agile methodologies, web services, and software design and development. SANS instructor Matt Bromiley explains and defines the various levels of compliance, outlines how risk management and compliance work together, and looks at existing gaps in implementation. The session then addresses how to automate compliance and risk management, including with cloud security controls, to help you answer questions such as: What is the provider’s role and what is the cloud user’s role? Why do you need risk management, and how do you use vulnerability monitoring? Matt Bromiley is a SANS Certified Digital Forensics and Incident Response instructor, teaching Advanced Digital Forensics, Incident Response, and Threat Hunting (FOR508) and Advanced Network Forensics: Threat Hunting, Analysis, and Incident Response (FOR572), and a GIAC Advisory Board member. His skills include disk, database, memory, and network forensics, as well as network security monitoring. David Aiken is a Solutions Architect Manager at AWS covering AWS Marketplace, Service Catalog, Migration Services and Control Tower. He leads a team of specialist AWS SA’s that help customers implement security and governance best practices using native AWS Services and Partner products. He is an AWS Certified Solutions Architect and his skills include cloud computing, enterprise architecture, agile methodologies, web services, and software design and development. *The views and opinions of the SANS Institute and their presenter, Matt Bromiley, are their own, and do not necessarily reflect the positions of AWS. Enterprises are faced with several strategy options when building their cloud migration. Building the optimal path for existing and future application needs can be challenging. AWS and AWS Marketplace provide the tools and software for each step of the migration process and post-migration, to sustain business value with a cloud operating model, increase your competitive edge, and modernize your infrastructure. You will also be able to ask questions and request a custom consultation for your business. Sign-up to attend the webinar or to get a copy of the recording. Customers migrating to AWS can use AWS Migration Hub to obtain a single view of all migrations into AWS. In this session, we provide an in-depth walkthrough of migration execution best practices and automated migration tracking. Learn how to use the Migration Hub migration dashboard to quickly understand the current state and velocity of your application migrations and effortlessly provide your CEO, CIO, and other key stakeholders an up-to-date status of migrating your portfolio. Amazon Web Services (AWS) and the SANS Institute* help security practitioners understand their options across key cybersecurity domains using a familiar operational language: The NIST Cybersecurity Framework (CSF). SANS Director of Emerging Technologies John Pescatore will show how to use the NIST CSF to make the leap to securing infrastructure-as-a-service (IAAS) and hybrid cloud implementations by selecting and integrating the most effective and efficient security services, including both native cloud security services and third-party controls. John Pescatore joined SANS as director of emerging technologies in January 2013 after more than 13 years as lead security analyst for Gartner, running consulting groups at Trusted Information Systems and Entrust, 11 years with GTE, and service with both the National Security Agency, where he designed secure voice systems, and the U.S. Secret Service, where he developed secure communications and voice systems “and the occasional ballistic armor installation.” John has testified before Congress about cybersecurity, was named one of the 15 most-influential people in security in 2008 and is an NSA-certified cryptologic engineer. The SANS Institute was established in 1989 as a cooperative research and education organization. Its programs now reach more than 165,000 security professionals around the world. *The views and opinions of the SANS Institute and their presenter, John Pescatore, are their own, and do not necessarily reflect the positions of AWS. Learn how GoDaddy achieved self-service, standardisation, and governance through AWS Service Catalog in the first 100 days of their cloud migration journey. We walk through GoDaddy’s use case of how they migrated to AWS with AWS Landing Zone, AWS Service Catalog, and the initial 100 days to establish their Cloud Center of Excellence to increase their speed of delivery and improve performance and reliability, while not sacrificing on security and financial controls. In this session, learn about the new, seller-specific features in AWS Marketplace that make it easy for sellers to close transactions with over 190K active customers. Learn how to publish and update products as part of your feature release process with Self Service Listings. We review how you can target specific customers with special or customized pricing using Seller Private Offers and how you can accelerate your contract negotiations with the Enterprise Contract for AWS Marketplace. Lastly, we discuss how to combine these and other AWS Marketplace features to grow your business by reaching new buyers and converting perpetual licensed customers to a subscription model. Software architecture, development, and operations patterns are changing with the increasing popularity of containers and related toolchains. In this session you’ll learn how to package and deploy applications faster by finding third-party container products directly through the Amazon ECS Console and running them on AWS Container Services such as Amazon ECS, Amazon EKS, and AWS Fargate. Until now, many customers spent time creating or searching for the right algorithm and model when using Amazon SageMaker. In this session you’ll learn how to build machine learning applications even faster by finding curated algorithms and model packages in AWS Marketplace and deploying them directly on Amazon SageMaker. As customers put more workloads into AWS, the number of Virtual Private Clouds (VPCs) a customer needs to manage grows as well. Scaling out an AWS environment can create manageability, workload segmentation, and security challenges. SD-WAN solutions offered by AWS Partners can allow organizations to scale up the number of VPCs as needed while segmenting and isolating workloads for easier management, application quality monitoring, and security. In this session, we will walk through a customer example of how an SD-WAN implementation simplified the management of a multi-VPC footprint while also improving application performance to WAN-connected branch offices. We are excited to announce a new feature that allows Partners to resell software solutions directly to customers in AWS Marketplace. Many AWS Customers prefer to purchase software solutions through Partners, benefiting from their knowledge of the customer’s business, localized support, and expertise. Partnering with Consulting Partners ensures that customers can deploy the right product at the right price for their business. Additionally, ISVs rely on Consulting Partners for scale, reach, specialization, and value-add services for their customers. This new feature combines these benefits and enables Consulting Partners to work with customers from the start of their procurement process all the way to purchase. Join this webinar to learn about the feature and how to get started with AWS Marketplace. As companies plan the migration of different workloads to the cloud, software procurement is being challenged to meet the new demands of the business. AWS Marketplace provides the tools and software for each step of the migration process and post-migration to sustain a cloud operating model, increase your competitive edge, drive business value, and modernize your infrastructure. This live webinar will illustrate how companies can migrate existing software and identify cost savings to accelerate their migration to the cloud with the AWS Marketplace. We will also be joined by guest speaker David Lowe, Senior Product Manager of AWS Marketplace, that will provide a live demo of AWS Marketplace Migration Mapping Assistant. Attendees will have a chance to ask questions and request a follow-up consultation on optimizing their existing software usage. For two weeks every year, the Universities and Colleges Admissions Service (UCAS) in the United Kingdom becomes a critical national service, as 700,000 students rely on the organization to find and secure university placements. From the moment applications are filled out until all information reaches the universities, UCAS needs to protect students’ personal data as well as meet regulatory compliance. In this webinar, you will learn how UCAS uses Splunk Enterprise Security running on Splunk Cloud to gain real-time, end-to-end visibility and reporting across on-premises and AWS environments to assess their security posture, and why an analytics-driven approach enabled them to identify anomalies that could indicate potential compromise. Matthias is a technical evangelist for Splunk in EMEA and is responsible for communicating Splunk's go-to market strategy in the region. He works closely with customers to help them understand how machine data reveals new insights across application delivery, business analytics, IT operations, Internet of Things, and security and compliance. Matthias has a particular interest and expertise in security, and is the author of the Splunk App for IP Reputation. As cloud environments enable developers to deploy new apps and updates rapidly, organizations struggle to ensure that those environments are protected from cyberthreats without slowing the iterative DevOps process. Palo Alto Networks provides organizations with the ability to automate the deployment of next generation security that controls workloads based on application identity and prevents cyberthreats within the allowed application flows. Join this upcoming webinar to learn how you can leverage Palo Alto Networks VM-Series on AWS to gain greater control over your applications, prevent known and unknown threats within application flows, create consistent and uniform security policies, and automate security deployments and policy updates. The AWS Migration tooling segment team has invented migration tool packages that serve three key business objectives. First, technology choice using competent tools from our ecosystem and AWS migration platform, with a tool recommender that helps customers identify the right tools to achieve their business objectives. Second, speed of procurement with "Single click" to procure the tools right from AWS Marketplace. Finally, the cost of migration with highly discounted tools that reduce the workload migration costs by 25 - 30%. In this session, we explain how our customers and SI partners can leverage these packages to enable the frictionless migration of thousands of workloads into AWS. In this session, learn how customers have gained greater control over their data and improved cost savings by using NetApp ONTAP Cloud from AWS Marketplace, a curated catalog to find, buy, and deploy third-party party software. We dive into how to minimize your storage footprint by using enterprise-class storage features, such as data deduplication, compression, and snapshots with zero impact on app performance. You also learn out how to can accelerate application development using FlexClone technology to clone images and quickly create multiple environments that look just like your original data. As companies plan the migration of different workloads to the cloud, software procurement is being challenged to meet the new demands of the business, such as agility and fast pace of innovation. AWS Marketplace is a curated digital catalog helps customers find, buy, and immediately start using the software and services they need to build products and run their businesses. With free trials, pay-as-you-go models, annual and multi-year subscriptions- all consolidated in one bill from AWS, procurement has the tools to meet their business demands. This live webinar, dedicated to businesses in the Nordics, will illustrate how companies can innovate their software procurement with the AWS Marketplace. AWS Marketplace helps customers migrate their workloads to AWS through a variety of ISV solutions and aids and accelerates the journey to the cloud. AWS Marketplace provides the tools and software for each step of the migration process and post-migration to sustain a cloud operating model. In this session, we explore the various stages of migration into AWS, common challenges that exist in each stage, and how AWS Marketplace helps our customers address some of these challenges. Sean Catlett. SVP Emerging Services at Optiv Inc.
AWS Marketplace is an online store that helps customers discover, purchase, migrate and immediately start using the software and services they need to build products and run their businesses. English Speaking Webinars.